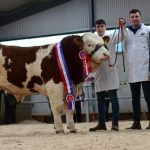 The Simmental society held its second spring sale at Tullamore on Friday evening April 13th and while there was a good clearance of close to 60% of bulls forward for sale the average price was down on last year’s sale. In the bull section the Judge Michael Oliver from Swinford, Co. Mayo tapped forward Tisaran Jameson as his overall Champion. 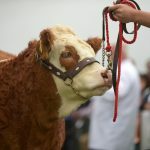 This January 2017 born bull was exhibited by Martin Mooney, Shannonharbour, Birr, Co. Offaly and is sired by Kilbride Farm Bantry and out of a Drumlone Anchor dam Raceview Evita Winty. The Egan family from Whiggsboro, Birr were the purchasers at €3000. 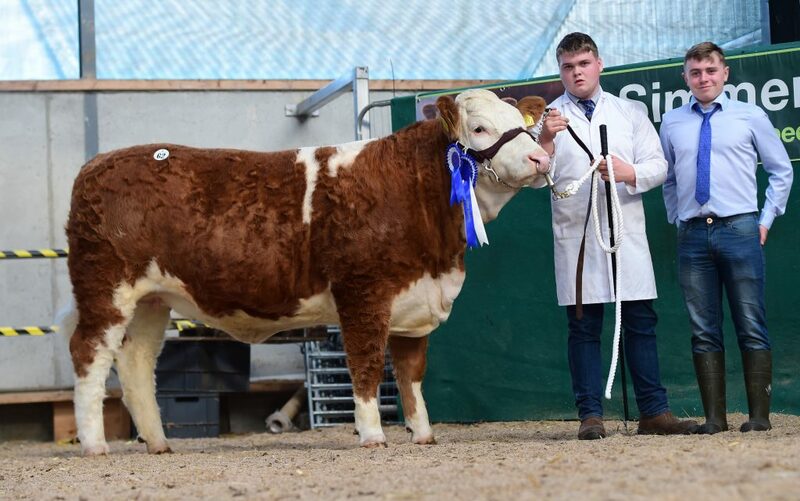 The reserve champion went to Joe Kelly, Ennis, Co. Clare with Mount Jammy Dodger a February 2017 born bull sired by Kilbride Farm Comber and out of a Glebefarm Tyson dam Mount Carol. Jammy Dodger sold for €3100 to Michael Redmond from Myshall, Co. Carlow. 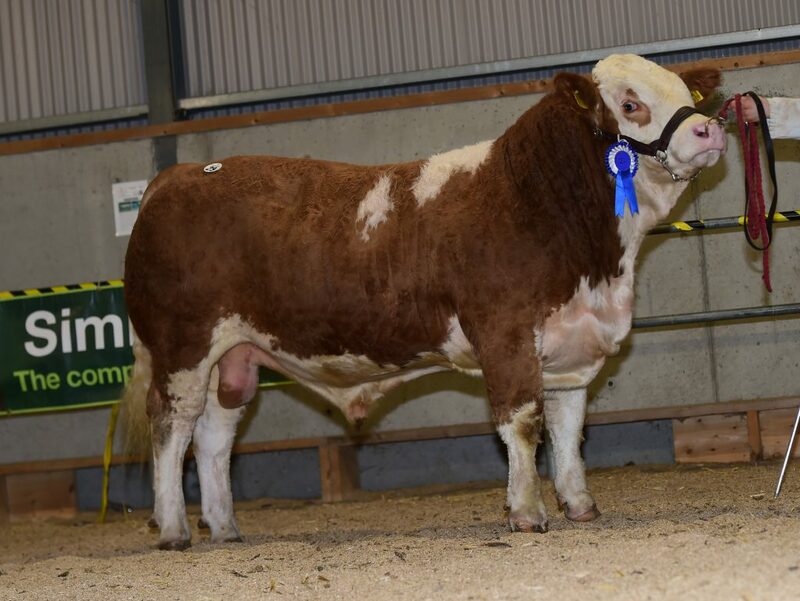 Topping the bull section at €3400 was Clonagh James Bond ET for Garrett Behan, Ballyfin, Co. Laois. 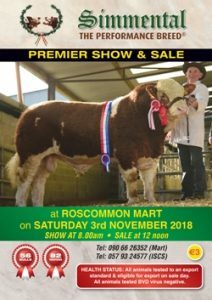 This February 2017 bull is sired by Clonagh Direct Debit and out of a Rosten Barney dam Milton Senhorita and was purchased by Eddie Punch from Cratloe, Co. Clare. 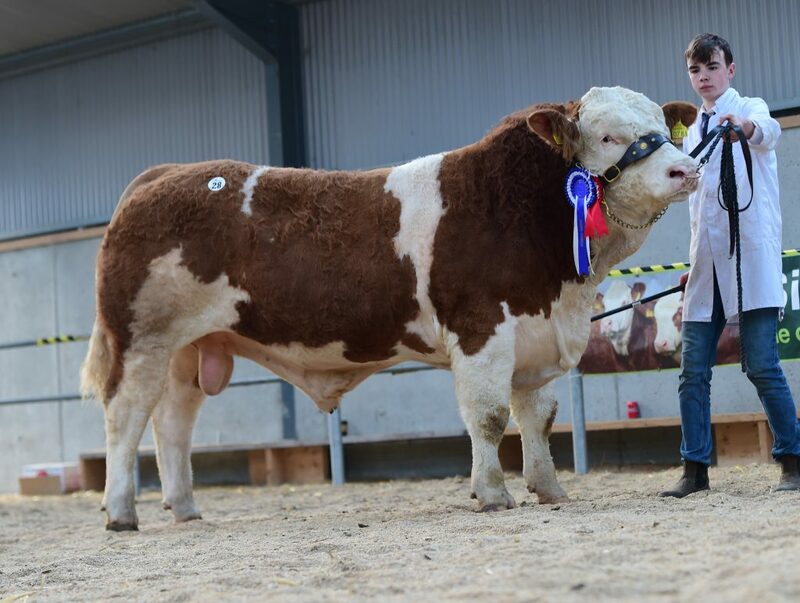 Selling at €3200 was Clonguish Hudson for Joe & Sean McGarry, Newtownforbes, Co. Longford. 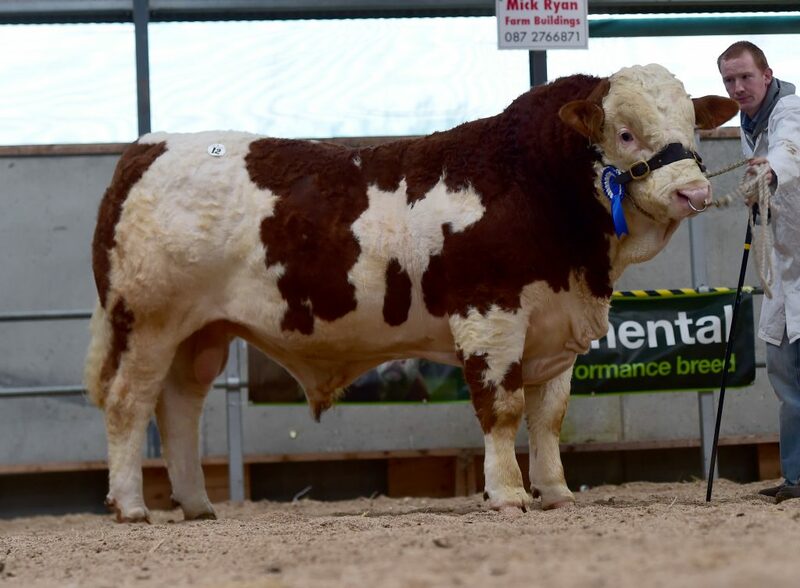 Sired by Kilbride Farm Bantry this December 2016 born bull was purchased by Peter Mimnagh, Moyne, Co. Longford. Three more bulls hit the €3000 mark with lot 4 first up for Garrett Behan. Clonagh Hincredible is sired by Kilbride Farm Dragoon and was purchased by John Hughes, Bagenalstown, Co. Carlow. Next at this mark was Clonagh Jack Daniels Et again exhibited by Garrett Behan. 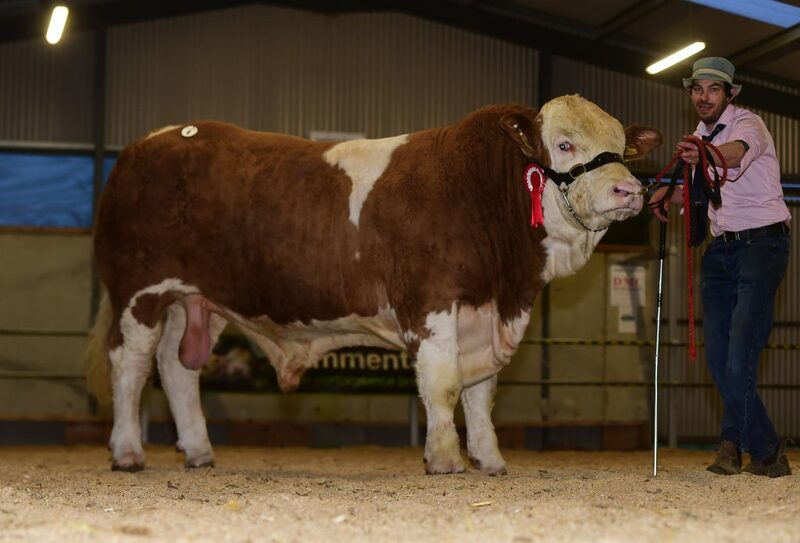 David Cronin from Dunmore, Co. Galway purchased this Clonagh Direct Debit son. 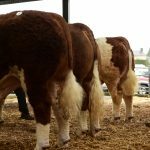 First time exhibitors Patrick & Elaine Brennan from Tulrahan, Claremorris, Co. Mayo also hit the €3000 price tag with Carraquin Jumbo. 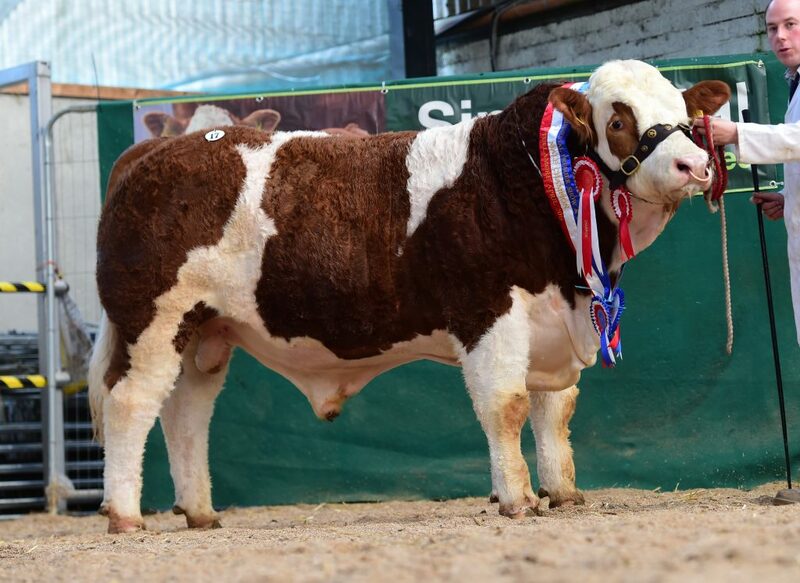 This Curaheen Tyson sired bull was bought by Victor Finnamore, Rathdowney, Co. Laois. In a very small heifer section the Champion went to Garrett Behan with Clonagh Jazzy Eyes ET. This February 2017 born heifer is sired by Clonagh Direct Debit and is also out of Milton Senhorita who is by Rosten Barney. 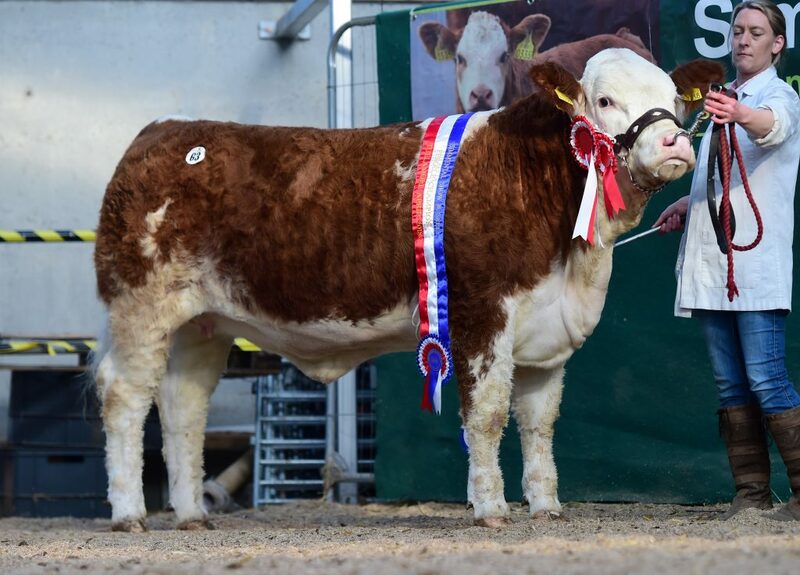 This heifer was sold at €3500 to Shane & John Murphy from Banteer, Co. Cork. The reserve champion went to Martin Sherridan, Mountnuggent, Co. Cavan with Dungimmon Heyley. 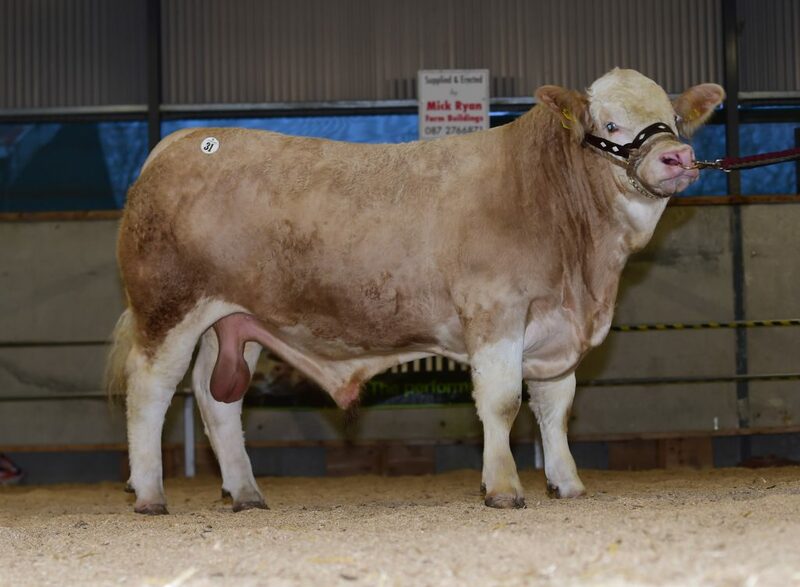 This December 2016 born heifer is sired by K8ilbride Farm Dragoon and is out of a Banwy T-Rex dam Clonagh Filly Peggy and was purchased by Michael Byrne, Clogherhead, Co. Louth at €2500. Overall heifers averaged €2280 for the five heifers offered for sale.